The Hanes, Champion, Maidenform and Playtex apparel is being shipped from the company’s distribution centers in Gastonia, Kings Mountain, Rural Hall and Winston-Salem, North Carolina, and near Martinsville, Virginia. Georgia: Caring for Others, Atlanta. North Carolina: Fayetteville mayor’s office and Second Harvest Foodbank of Metrolina, Charlotte. South Carolina: Aid Unlimited, Fort Mill. 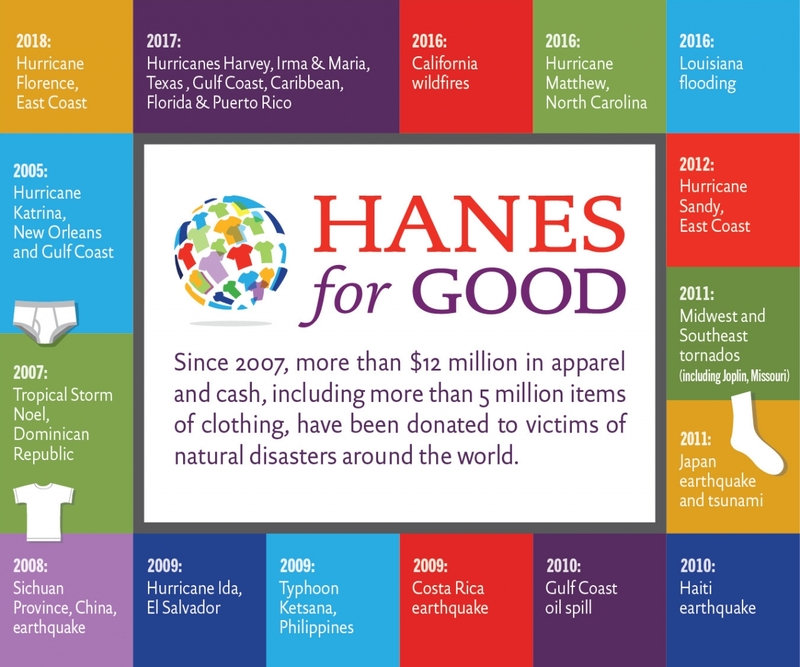 In the past decade, HanesBrands has donated more than 5 million items of clothing under its Hanes For Good corporate social responsibility philanthropy efforts to assist natural disaster victims in the United States, Puerto Rico, the Dominican Republic, Haiti, Japan and elsewhere. For those who want to help Delivering Good in its relief efforts by donating new apparel or cash, go to www.delivering-good.org/disaster-relief/. Every $10 donated enables Delivering Good to distribute more than $100 of new product to relief agencies serving those in need.